Citizens' Dialogue with President of the European Commission Jean-Claude Juncker. 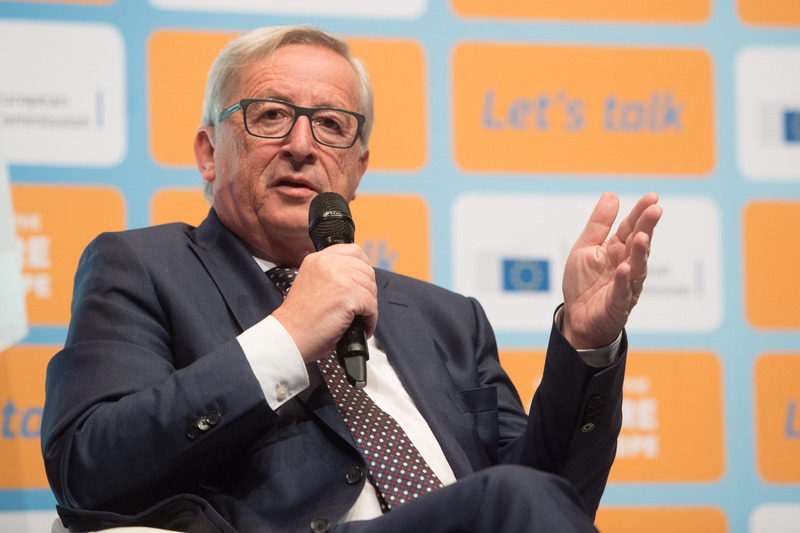 On 15 November President Juncker honoured his promise made after his 2016 Citizens' Dialogue in St Vith to return and hold another Citizens' Dialogue on the same day (a particularly poignant date as 15 November is the day of the German-speaking Community in Belgium). 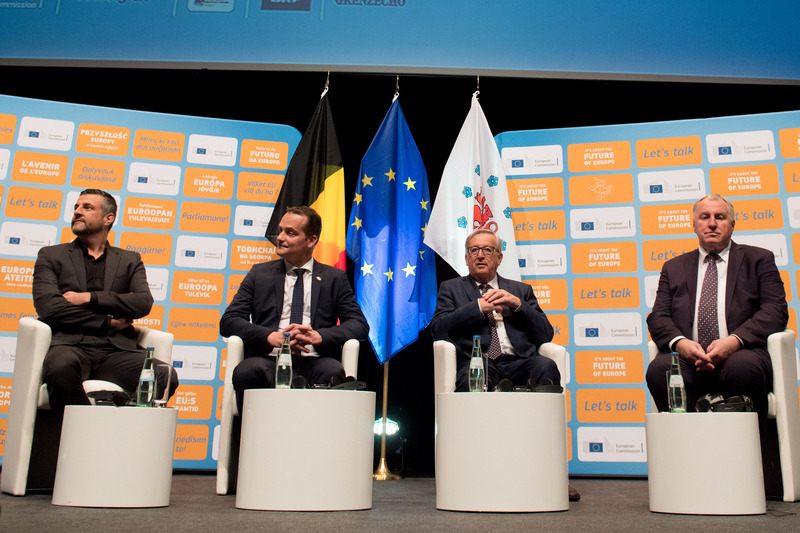 He was joined on stage by Oliver Paasch, Minister-President of the Belgian German-speaking Community, Karl-Heinz Lambertz, President of the Committee of the Regions and Pascal Arimont, Member of the European Parliament. The lively discussion with some 700 people touched upon a wide range of topics; from regional and local issues to broader international concerns. These ranged from the recent events in Catalonia, Brexit, tax evasion, security, cross-border public transportation, recycling, and the new social pillar, to the German-speaking community's access to healthcare. The Dialogue began with a discussion with the stage members about the importance of hearing directly from citizens and how they incorporate this into their work every day. The first questions from a participant from Kaiserslautern revolved around Schengen and security. The President expressed that we are committed to the International Conventions we have signed but that a new registration process is being introduced as a way of information monitoring, not surveillance, he emphasised. Questions were asked about re-allocation of refugees, and it was discussed that refugees deserve to have good quality of life which countries across the EU are helping towards, especially Belgium and Luxembourg whose refugee intakes were mentioned. Several participants asked questions surrounding the impending Social Summit in Gothenburg on 17 November 2017 and how the new social pillar will be in practise. Regarding social issues there was a multitude of questions on the posting of workers and equal pay, minimum wage, social dumping. It was expressed that these were on the agenda for Gothenburg and the new social pillar, as well as education and equal opportunities. The themes of harmonization of taxes and tax evasion were also discussed in detail. Participants asked what the Commission's future plans would be regarding harmonization of taxes. It was emphasized that this Commission is fighting tax dumping and that there are 24 new initiatives in the area of taxation. It was clearly stated by a participant that multinationals should have to pay taxes and the President referred to the idea of an EU wide minimum corporate tax base and the proposal to tax internet giants on their turnover rather than on their profits . Local issues were also surfaced by participants from Eupen and other areas in the German-speaking community who asked about the high costs of cross-border travel, prevention of a milk crisis, and the right to be treated in German at hospitals. These were discussed in detail by all four panellists with various solutions including the idea of a return to the previous system and that German speaking citizens of Belgium should have this right guaranteed to them. Finally, participants asked questions about separatist movements and the Future of Europe in terms of affairs in Spain with Catalonia and Brexit. It was answered that fair treatment of British citizens would be key to the negotiation process, and that regarding domestic issues in autonomous governance in Spain, they should look to Belgium as an example of how to successfully overcome these issues and work together. The lively and engaged discussion ended on the note that we have wind in our sails in the EU now, and the rest of the world looks to us as an example. We must believe in ourselves, share our wealth more fairly and speak with one voice.